This is so simple it hardly warrants a recipe. But in the winter I find myself seriously in need of inspiration in the salad department, and this was so good I made it for lunch the last two days in a row. It’s so simple that the quality of the ingredients really matters. There’s nowhere for anything to hide. 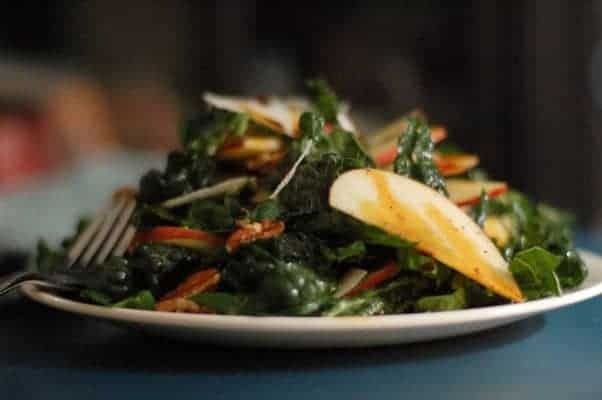 I’m sure by now you know about lacinato kale, sometimes called dinosaur kale or Tuscan kale or cavalo nero. It is more tender than its curly brethren, and it’s my favorite variety of kale for salads. Choose a bunch that’s deep green, with firm stalks and robust leaves. 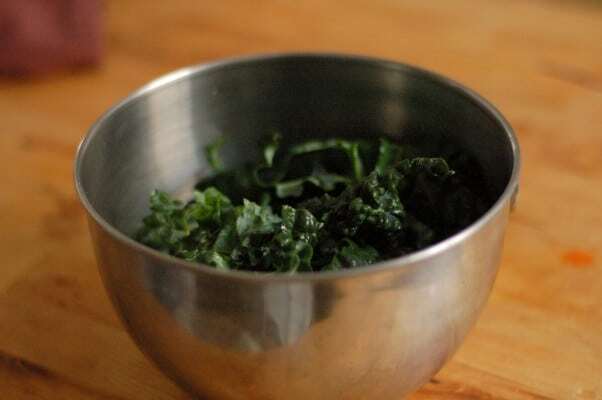 A salad is no place for limp kale. In winter, I tend to favor Fuji apples. At least in Chicago, they seem to be the apple variety most likely to taste a little bit sweet and tart and fresh and not just like old refrigerator. Feel free to use your favorite variety here. It seems like when it comes to vinegar so many people only have grocery store balsamic in their pantries. If you’re in that number, I’d encourage you to give sherry vinegar a try. It has a complex flavor with serious acidity and only a hint of sweetness. You can get a decent one for much less than a real aged balsamic, and it plays really well with the other flavors in a basic vinaigrette. And as for olive oil, use one that you like the taste of on its own–it doesn’t much matter if it’s peppery or grassy or fruity. There are too many good ones to recommend just one. Saba is reduced grape must (which is unfermented grape juice). It’s thick and syrupy and tastes almost raisin-y. 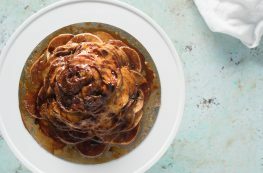 I love the way it complements the apple-parmigiano-pecan combination. If you can’t find it or don’t want to splurge, you can obviously leave it off, but it’s really nice here. Use pecans that you’ve purchased recently. Nuts can go rancid quickly. I store mine in the freezer to keep them fresh longer. And toast the pecans. I toast them in the toaster oven, but you can also toast them in a dry skillet for a few minutes until they smell fragrant and roasty. You could use walnuts here if you prefer. And use real parmigiano reggiano or another high quality hard cheese. It really makes a difference. Looking for more salad inspiration? Try this citrus, avocado, and shaved fennel salad, this lentil arugula salad with feta, or this grilled cabbage salad. The quality and freshness of the ingredients here is key. Other than that, feel free to adjust this to your liking. It’s salad–the rules are flexible. 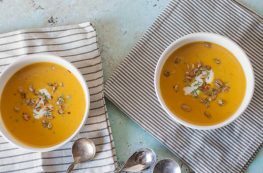 In a medium bowl, whisk together the mustard and sherry vinegar. 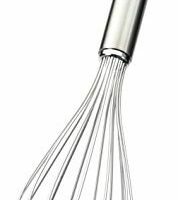 Stream in the olive oil and whisk until emulsified. Season with a pinch of salt. 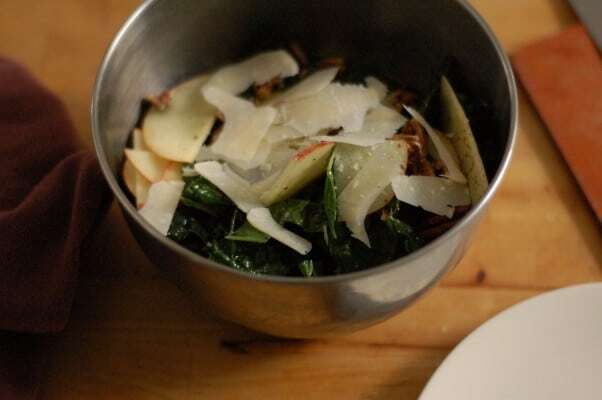 Add the kale and toss until the greens are well coated with vinaigrette. 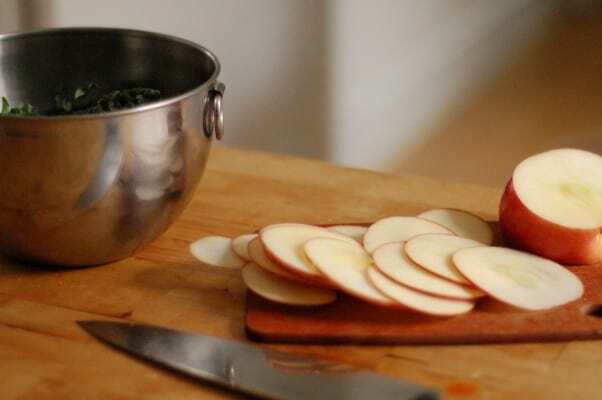 Add the apple and grind a generous amount of black pepper directly over the apples. Season with another pinch of salt. Add the pecans and parmigiano reggiano shavings and toss. 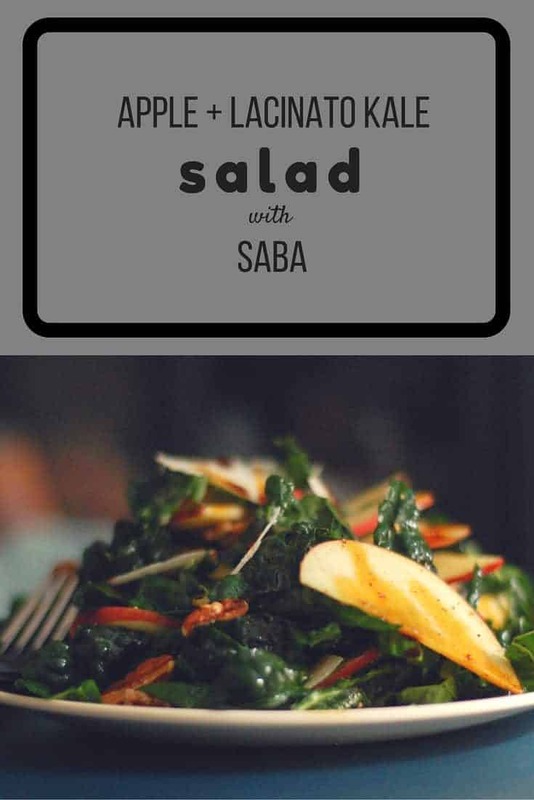 Transfer to a plate, and drizzle with saba.